With only days to go before the planned conclusion of the new EU Directive on Copyright in the Single Digital Market, Europe's largest and most powerful rightsholder groups — from the Premier League to the Motion Picture Association (MPA) and the Association of Commercial Television in Europe — have published an open letter calling for a halt to negotiations, repeating their message from late last year: namely, that the Directive will give the whip hand to Big Tech. Article 13 — which still mandates copyright filters for big platforms, despite months of obfuscation — is the brainchild of the music recording industry, who invented the idea of the "value gap" as a synonym for "when we negotiate with YouTube for music licenses, we don't get as much as we'd like." Seen in this light, the unworkability of Article 13 is a feature, not a bug. Putting Google on the hook to give in on license negotiations or be forced to do the impossible is a powerful negotiating stick for the recording industry to hit Google with. The problem is that this tool will not only be wielded by record executives against Google: it will allow any of the Internet's two billion users to claim copyright over anything (including the record industry's most popular works) and improperly collect license fees, or simply block the material from public view. That's not the only problem, though. In the course of negotiating Article 13, European lawmakers made concessions that make the proposal (barely) coherent and affordable by Google (though not, importantly, by Google's small European competitors, who stand to be squashed flat by the dancing elephants of Big Tech and Big Content). Those concessions have enraged the rest of the entertainment industry, which had bigger plans. After a few European court judgments, the "audiovisual sector" appears to have revived its old plan to assume control over the online platforms outright through litigation, and they're worried that Article 13 will make that far more difficult — essentially locking down the music industry’s idea of a reasonable Internet, instead of how the rest of the media industry would like it.. This alternative future is not an outcome we'd be pleased with. The Internet isn't a video-on-demand service:it's the place where we do education, family, employment, politics, civics, charity, romance, and so much more (including entertainment). Neither the Article 13 proposal that the record industry hopes for nor the dystopian vision of the Internet as a subsidiary arm of the sports leagues and movie companies are futures we're willing to sign up for. But as the letter from the sports leagues and movie companies shows, Article 13 is not ready to become law. It represents the narrow interests of a handful of music companies, hastily bodged to get through a sceptical Parliament and the demands of Big Tech, not the broad interests of Europeans (more than 4,000,000 of whom have objected to it) nor the interests of other giant players in the entertainment sector. 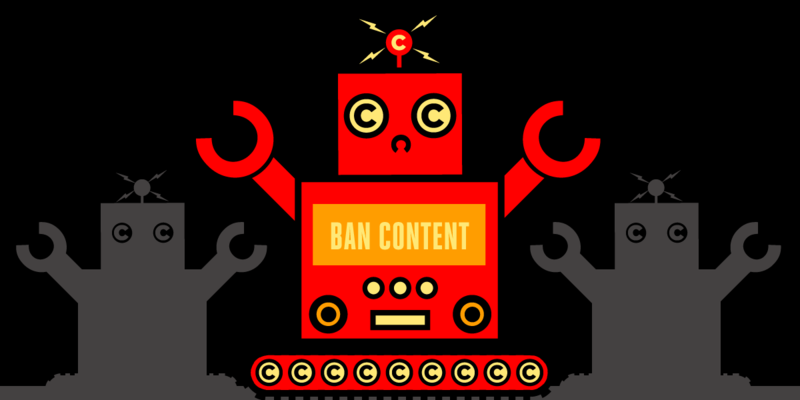 The Copyright Directive is the first update to EU copyright law in 17 years and it mostly consists of badly needed technical tweaks. By reintroducing controversial, half-baked versions of Articles 11 and 13 last spring, the German MEP Axel Voss has put the whole project in danger, and is holding all of Europe's copyright users to ransom in order to advance the interests of newspaper proprietors and record executives. As the EU national negotiators get ready to sit down with their counterparts from the European Parliament to finalise the Directive, it's vital that Europeans contact their national governments and tell them not to allow these proposals to pass.